The night began with Ava Bartlett slicing over a second from her 25m fly time in the nine-year-old category for third place in 23.57. Seren Majed, in her first competitive gala, stormed home to win the 10-years freestyle in 16.94 and Luca Warr, in his first individual race, clocked a personal best (PB) of 21.55. 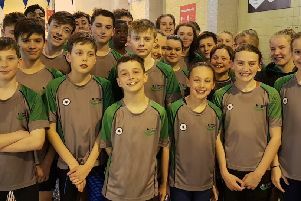 In the 11-year-olds, Charlotte Whittle swam six seconds faster than before and William Barnes improved to 45.27 in their respective 50m backstroke events, followed by 12-year-olds Emma Hockney and Darshan McGregor setting new bests in the 50m breaststroke events. First-timer Isabelle Snowden clocked 23.15 (fourth) in the nine-years 25m freestyle and in the fly Nell Coster, whose infectious enthusiasm bubbled throughout, was second in 19.19 for the 10-years category. Emily Jones managed a 1/100th improvement in her 11-years 50m freestyle for a PB of 38.55, the first of a run of fourth-place finishes. She was followed by Joe Harrison in the 50m freestyle (36.19), before first-timer Kate Hopper and Eric Batt competed in the 50m backstroke for 12-year-olds. Kate dropped almost two seconds to 43.50, while Eric clocked 38.36, both for fourth place. In the first set of relays Bartlett, led off Bella Cliffe, Snowden and Sophie Davies in the nine-years 4 x 25m freestyle for a respectable time of 1:25.96, only to be disqualified as a team for an early takeover. Coster began the girls’ 10-years medley relay on backstroke to Charlotte Holmes-Higgin, Seren Majed and Bartlett, who was straight back up into the higher age group, for fifth place in 1:32.12. The boys’ squad of Louis Clark, Oscar Moffatt, Lawson Gray, who stepped to cover an absent sick swimmer and was there with his brother, and Warr picked up third in 1:31.22. Jones, Izzy Davies, Whittle and Seren Diehl were third in the 11-years 4 x 50m freestyle event (2:41.12) and the boys’ team of Barnes, Lawson Gray and Harrison, both up an age group, and McGregor came home in fourth in 2:38.47. In the 12-years medley, Diehl led the girls on backstroke, followed by Hopper, Hockney and Amber Tooker for third in 2:59.34, and the boys’ squad of Batt, Eze Svichla-Fekete, George Gray and McGregor were fifth in 2:59.34. Back in the individual races, Sophie Davies was just shy of her Herts League time from the previous gala in 25.08 for the 25m backstroke. Seren Majed romped to her second win of the night in the 10-years 25m breaststroke in an impressive 22.48 with Lawson Gray in second for the boys in 21.50. 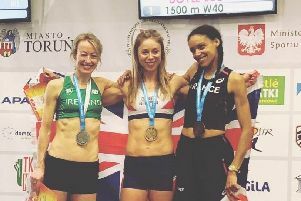 Diehl had been concerned about her 50m fly, but gallantly swam up in the 11-years group and claimed second place in 41.87, shaving a huge nine seconds of her previous best. In the 50m freestyle Amber Tooker swam three seconds faster than before but missed the wall on her turn with a goggle malfunction. Meanwhile, Svichla-Fekete showed new confidence after being part of the team for the recent Herts League meet and displayed great speed to hammer home four seconds faster than before in 33.09 for the 12-year-olds. Cliffe’s first-time 25m breaststroke brought home a 28.92 time and Clark’s first team race delivered 20.88 to win the 25m backstroke as a 10-year-old. The 10-year-old Austin Clements gladly took on the 11-year-olds and was pulled to a four-second improvement in his 50m breaststroke before Hockney and George Gray (45.15, PB) rounded out the individual races with the 12-years 50m fly. The 10-years girls’ freestyle relay included nine-year-old Cliffe and came home third as did the 10-year-old boys’ team. After a couple more relay disqualifications on technical infringements, the squadron relay (8 x 25m, four boys, four girls) picked up a third-place finish place to end an exciting evening. Elsewhere, the club’s Dan Chennells visited the Wycombe Level One Open meet where he produced a long-course 100m freestyle PB of 57.95, which also included a PB of 27.52 after 50m. At the Luton Level One meet, club-mate Eva Lawson continued her remarkable run of form to win the 11-year-old 100m backstroke in another PB of 1:18.71, despite not going into the meet as the fastest seed. Tamsin Moren attacked the 200m breaststroke but faded in the last length as she paid for her fast start to end in 3:05.06 but gained praise for the aggressive swim. Zac Patel’s best result was the 50 fly, where he posted 26.75, and Harry Thorne, on limited training, clocked 1:19.91 for the 100m breaststroke in his first effort at the long-course distance. Finally, at Guildofrd, Ish Rahim clocked a pleasing 27-second swim in the 50m fly and a new PB by 30 seconds in the 50m backstroke.